Creating a niche of Oncology Medicines such as Nublexa Regorafenib Tablet, Alimta Injection, Zytiga Tablets, Jevtana Injection, Cellcept Tablets, Everolimus, Avastin Injection, Aprecap Capsules, Neulastim Injection, Sutent Capsules and many more items at its best, with utmost quality. Uses:- Nublexa contains the active substance regorafenib. 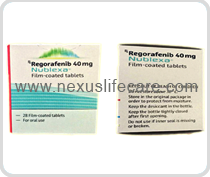 Nublexa Regorafenib is a medicine used to treat cancer by slowing down the growth and spread of cancer cells and cutting off the blood supply that keeps cancer cells growing. Nublexa is a multikinase inhibitor (MKI) that targets cancer growth and progression by inhibiting multiple protein kinase. Treatment with Nublexa has shown to improve survival in patients with colorectal cancer and advanced gastrointestinal stromal tumour (GIST) who have been previously treated with 2 tyrosine kinase inhibitors. Side Effects:- Diarrhea , dry mouth , weight loss n weakness , headache.